Supafolio Dashboard manages the display of processed metadata on a chosen web page as well as site search analytics. We import and reorder your metadata from any source - including ONIX, XML and CSV. Default metadata can be updated & changed in real time, such as titles, descriptions and book jackets. Ideal for marketing campaign or Search Engine Optimisation. Change information, add additional marketing assets like PDF, mp3, video, links, web samplers and images. Promote individual products or groups of products dynamically to support campaign marketing. Custom business rules can be applied to metadata, such as linking different formats, changing product or author names, creating SEO-friendly urls & hiding editions. Boost individual products within the search results to promote the most important content on your website. 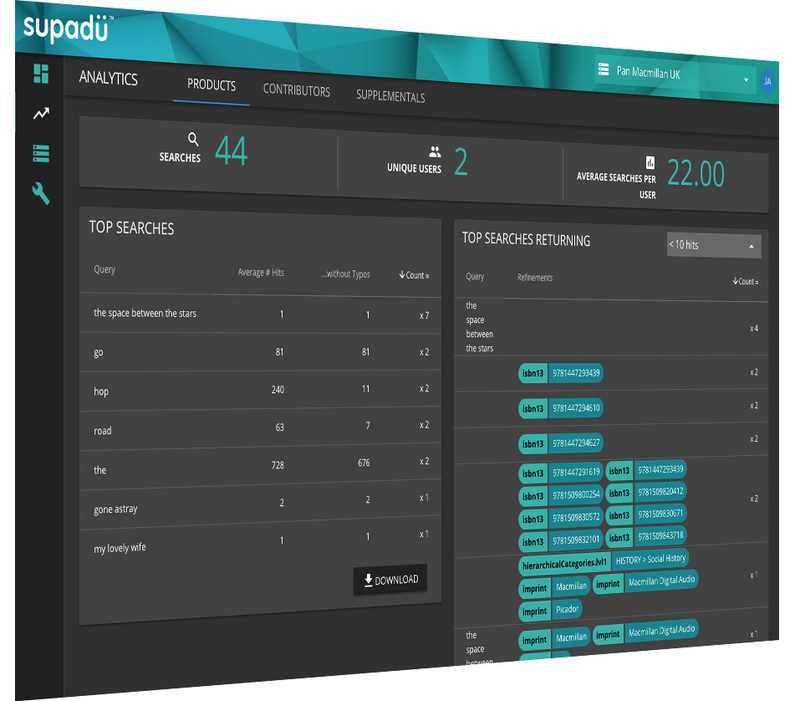 Supafolio search analytics dashboard gives you the data and insights you need to understand what your users are looking for, where you’re losing them, and how to keep them interested. We aggregate the multiple “character by character” queries to find the words or expressions searched by your users, and return a list of the most popular expressions searched, with some stats. If you want to know what your index catalogue is missing, or improve the keywords and synonyms you’re using. Take a look at the most popular queries that returned 0 (or a small number of) results. It’s possible to see two different tags - mobile and website - to see how mobile users search in comparison to website users in the dashboard. To see how your users are using your search filters to constantly improve the user experience. See where the queries are coming from geographically and get a better understanding of what people are looking for in each location.